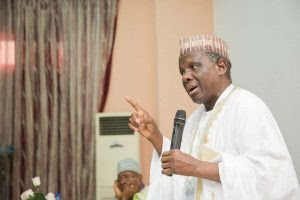 A popular politician and aspirant for the 2019 presidential poll, under the platform of the Social Democratic Party (SDP), Prof. Jerry Gana, has warned that Nigeria is facing an existential threat in the proportion comparable to the end of Biafra war under President Buhari. Prof. Gana said this when he formally declared intent to to contest for the presidency, next year. “Being a patriotic and committed democrat, who has carried a burden for the rapid development of our nation for decades, I am deeply concerned at the very real prospect of Nigeria imploding; unless our great party comes to the rescue with a God-fearing, dynamic, untainted and credible leadership. Nigeria is facing an existential threat, the seriousness and proportion of which have never been witnessed since the end of the war. “There is crippling uncertainty everywhere. People are suffering unprecedented and untold hardships as a result of arrested development. Insecurity that has rendered human life brutish, short and nasty is rampant across the zones, states, communities and villages. “Asymmetrical war on corruption is fuelling further ethnic decadence, while anxiety, unpatriotism and poverty have coalesced into a creepy epidemic of self-doubt. In all of these, the current leadership of the nation, at the highest level of government, seems unconcerned, incompetent or incapable of turning around the drift. “Having consulted and affirmed by my family, local community, friends and a cross-section of eminent citizens and stakeholders across the core national divides of ethnicity, religion and regions, I am convinced that this is the fit time for me to offer for this national assignment on the platform of our great party. By my track record, my desire to seek to contest election into the highest political office is borne out of my patriotic zeal and conviction that with my pedigree, experience, skills and academic endowment, I can provide the requisite leadership to transform the fortunes of our people. “It is my hope and prayer that the party will positively note my interest as under your able leadership, it offers opportunities for service to our dear country, Nigeria,” he said. In his response, SDP Deputy National Chairman, Dr Ishaq Abdul Ahmed, who represented the National Chairman, Olu Falae, described Gana as an asset to the party and the country.